Before answering the question as to where are interest rates headed, let us first try and understand what determines interest rates and how it affects us. Well as we know that interest rates are determined by RBI, with help of tools like repo rate, reverse repo, cash reserves etc. but its perhaps the most difficult job for the RBI to manage, considering that a lower interest rates helps in economic growth at the same time low interest rates can fuel inflation thereby affecting the common man. Whereas in case of higher interest rates helps to curb inflation in cases of demand supply mismatch but also takes its toll on the growth rate. So where are interest rates headed? The biggest affect of a an interest rate rise is on the economy. Well at present most banks have a BPLR of around 13-14% when it comes to lending for SMEs or even higher if the balance sheet is not strong. There by reducing the conducive atmosphere for the new investments and off-taking of loans. Thus it badly affects capacity addition and also reduces the economic growth. If one has a look at last month IIP nos then they were at 1.9% in October 2011 v/s 10.7% in October 2010, which clearly indicates that there are strong signals of slow down in the economy thanks to a very high interest rates. Thus making it more necessary for the RBI to reduce down interest rates on a very urgent basis or there can be overall slow down in GDP growth rates. Though at present the inflation stays quite high, one cannot deny that there is major fall staring in the eyes of commodity markets due to slowing down in the world economy as a whole. The slow down can be also be attributed to European crisis. Thus fall in commodity can lead to lowering of petrol prices which as per early indication 2 days back can see Rs. 2 fall decline in petrol prices. Sometime back RBI had declared that it has a comfort level of 3.5 – 4.5% for inflation in India. Where as at present the inflation is hovering around 9% which was much higher around 10-11% during earlier quarters. But there can be further lowering of inflation starting next year considering that there will be higher base effect and also a correction in major commodity prices. Thus inflation should moderate starting FY 12 first quarter next year! Well if we look at data for last 10 years we can see that interest rates has mostly a cycle of around 2 years, where in it peaks at a start and by the end of 2 year it lowers down. Well since last few years one can state that the highest rate of interest one can see is around 14-16 % and the lowest rate of interest one can see is around 8-9%. Considering that we are already at interest rate of around 14% one can expect the interest rates to move lower. 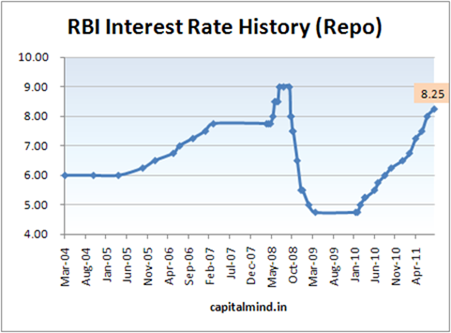 Also from the above chart one can easily make out the interest rate cycle in India. One can take benefit out of the present interest rate cycle while buying for home loans, In order to know how to benefit out of the interest rate cycle check here: Floating rate v/s Fixed rate on home loans. All countries get huge loans from World Bank and IMF. IMF and World Bank categorize countries based on how rich they are before deciding the interest rate for these loans. Developing countries are seen as high risk and are hence charged with high interest rates which transforms to what you and I pay to Banks in India when we take a loan. This is evident from the fact that in USA or Switzerland housing loans are at 3 to 4% and in countries like India its more than 10%. This is one of the many ways in which the West benefits from the hard work of the people in the east. The rest are sanctions/embargo and stuff. Developing countries have little presence in the decision making board of these huge monetary organizations, so in a way India is like a worker and they are the Boss. Our Govt doesn’t really care anyways as its the citizen who will be paying it back. There are some American companies like Moodys and ‘standard and poor’ who rate us as high risk and themselves as ‘AAA’. So every Indian Citizen end up paying 11% – 3% =8% to the rich countries. They know how to keep our Politicians silent (bribe the leader and the whole country works for you!). Any effort to offend World Bank would be dealt with Economic sanctions or even War (like what happens in Iraq, Syria) so its better to obey them. In short its the money game which West plays on us and we always loose making them rich. interest will be less not but demand is more n more. I think that, When flow of money in economy is high, At that time goverment increase the interest rates, So that people will start saving to get high interest rates and stop taking debt because they have to pay more interest on loan. An excellent educational article. However I would like to add that the above are version 1.0 theory. The economy is following version 2.0 rules now. 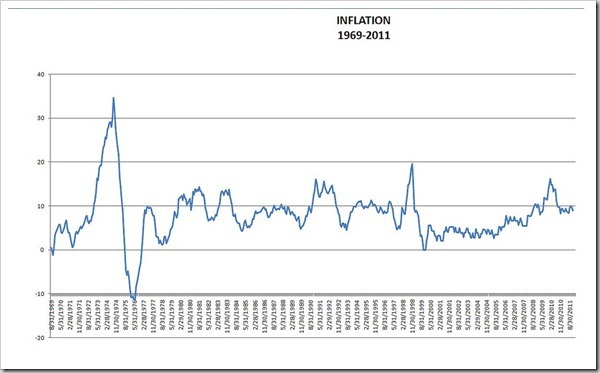 Lets take the above theory that high interest rates curbs inflation. In version 2.0 the opposit is happening. With higher interest rates industry is slowing down thereby reducing production and with higher demand, inflation is up. Proof : 13 increases in interest rates and inflation in double digits. From the view of the banks, the customers are three types. Those who can never default, those who might default, those who are defaulters. When you increase interest rates, some of those who can never default become ones who might default, those who might default are defaulting, those who are defaulters remain defaulters. Proof : Bank NPAs are going up by 33%. Bottom line : Chidambaram, Pranab, and all the gang is dangerous to the health of Indian economy.